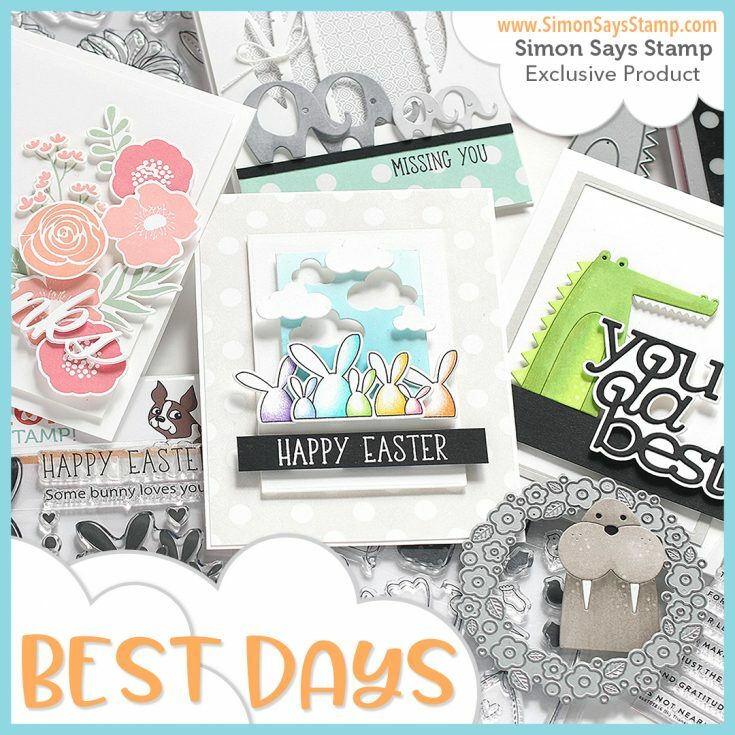 Hey lovelies, I am super excited to be part of the Simon Says Stamp Best Days Release Blog Hop. You should have arrived here from the lovely Bibi Cameron’s Blog. This is the second day of the hop, to check out the first day head on over to the Simon Says Stamp blog. If you haven’t checked out the Best Days release then you can click on the banner below, or I have listed the products from the release at the end of this post. I love the mix of products from this latest release and you can see what I created using the Picture Book Croc die by checking out my post here. For this card I am using the super sweet Oh Baby Stamp set & Co-ordinating die set. This is a really sweet stamp set for anyone who is expecting, or if you know someone with a new baby. The set has outline images so you can colour, but they have also included the solid image so you if your not a colourist, or are looking for a different look then you can easily do so…this also makes this set a lot more versatile. I really didn’t know what images to use for my card and ended up colouring them all, but in the end only used the bib image. I created the background using a cloud stencil and some Tumbled Glass Distress ink, added the sentiment and left that to one side whilst I coloured the images. I stamped them using Simon’s Barely Beige ink and coloured them using Polychromo Pencils, I wanted a very soft look…which was quick tricky for me as I do like a lot of depth. I die cut them using the co-ordinting die and then added a “washing line” with some twine and attached them using some mini pegs that I have had in my stash for years. To tie in the blue from the bib i added some Doddlebug paper along the bottom of the card and adhered the main panel using some foam tape. Simon is very generously giving away a $25 gift card for each stop on the hop, so make hop along to everyone’s blog on the list below. The winners will be announced on the Simon Says Stamp Blog Next Wednesday so make sure you check it out. Thank you so much for stopping by today. Happy hopping and have a great weekend. Those are darling! Thank you for the inspiration! I’m guessing you made all those cards in the frame above the baby card. I love them all! You are amazing! Your baby card with the bibs flapping in the breeze is genius! I love how it looks and how they are hanging. Reminds me of what my mom had to do before we got a dryer and what the Amish do now. Thank you for showing us all of your beautiful cards and for giving us the chance to win something! I love your cards there are super beautiful and sweet! great welcome baby cards; thanx for the inspiration! Sweet little baby bibs……love the soft colors. Adorable baby card! Wish I had this stamp set last year.